If what you're looking for is a conveniently located hotel in Battambang, look no further than King Fy Hotel. The hotel lies 0.5 km from the city center and provides accessibility to important town facilities. With the city's main attractions such as Khourn Bunthy - Souvenir Shop, colonial buildings, Wat Kandal within close reach, visitors to the hotel will just love its location. Offering hotel guests superior services and a broad range of amenities, King Fy Hotel is committed to ensuring that your stay is as comfortable as possible. Guests of the hotel can enjoy on-site features like free Wi-Fi in all rooms, 24-hour front desk, luggage storage, Wi-Fi in public areas, car park. 65 rooms spread over 7 floors provide a warm and pleasant home away from home. Modern comforts such as television LCD/plasma screen, internet access � wireless, internet access � wireless (complimentary), whirlpool bathtub, non smoking rooms can be found in selected rooms. The hotel's recreational facilities, which include hot tub, indoor pool, spa, massage, table tennis are designed for escape and relaxation. King Fy Hotel is a smart choice for travelers to Battambang, offering a relaxed and hassle-free stay every time. Situated in West River Bank, Battambang Resort is the perfect place to experience Battambang and its surroundings. The hotel lies from the city center and provides accessibility to important town facilities. No less exceptional is the hotel's easy access to the city's myriad attractions and landmarks, such as Wat Kampheng, Victory Club, Governor's Residence. At Battambang Resort, every effort is made to make guests feel comfortable. To do so, the hotel provides the best in services and amenities. For the comfort and convenience of guests, the hotel offers free Wi-Fi in all rooms, daily housekeeping, luggage storage, Wi-Fi in public areas, car park. In addition, all guestrooms feature a variety of comforts. Many rooms even provide clothes rack, complimentary instant coffee, complimentary tea, free welcome drink, locker to please the most discerning guest. The hotel's hot tub, outdoor pool, massage, garden are ideal places to relax and unwind after a busy day. When you are looking for comfortable and convenient accommodations in Battambang, make Battambang Resort your home away from home. Phka Villa Hotel is owned and run by a local family. With its location in the heart of the city, guests readily savor easy access to various attractions. It is only a 10 minutes� walk to Battambang Museum and Psar Nat shopping center, an hour from Sisophon City, and two hours from Piopet Border. 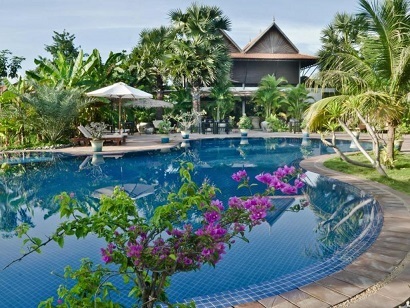 Phka Villa Hotel is a fine retreat, offering a large outdoor swimming pool decked beautifully with cozy sun-loungers. Rooms are furnished in the Khmer tradition, unleashing a pure thrill of the local lifestyle. All guestrooms are set around the pool and equipped with two private verandas and a bathroom, as well as modern facilities including cable TV and Wi-Fi. The restaurant serves authentically local flavors, and the bar serves the self-acclaimed best cocktails in town. Other services include massage treatments, laundry, tours and ticketing, a city and airport shuttle, and around-the-clock front desk assistance. 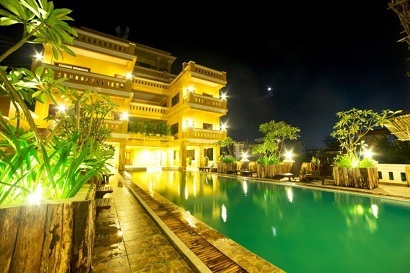 Delux Villa, located in City Center, Battambang, is a popular choice for travelers. The excitement of the city center is only 0.1 Km away. 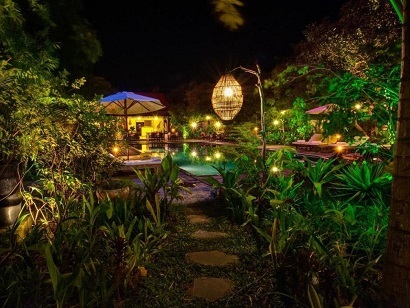 A well-kempt environment and its proximity to Battambang Bat Caves, BTB Souvenir Shop, White Elephant Pagoda (Wat Tahm-rai-saw) give to this hotel a special charm. At Delux Villa, the excellent service and superior facilities make for an unforgettable stay. A selection of top-class facilities such as 24-hour room service, free Wi-Fi in all rooms, 24-hour security, daily housekeeping, taxi service can be enjoyed at the hotel. The hotel features 16 beautifully appointed guest rooms, many of which include television LCD/plasma screen, additional bathroom, free welcome drink, mirror, sofa. The complete list of recreational facilities is available at the hotel, including outdoor pool, indoor pool, massage, pool (kids), garden. When you are looking for comfortable and convenient accommodations in Battambang, make Delux Villa your home away from home. 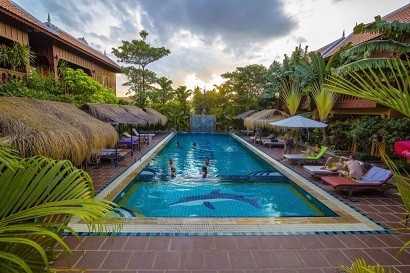 Conveniently located in Battambang, Bambu Hotel is a great base from which to explore this vibrant city. From here, guests can enjoy easy access to all that the lively city has to offer. Visitors to the hotel can take pleasure in touring the city's top attractions: ROMCHEIK 5 Art Space, Wat Bovil, Wat Kandal. At Bambu Hotel, every effort is made to make guests feel comfortable. To do so, the hotel provides the best in services and amenities. Guests of the hotel can enjoy on-site features like free Wi-Fi in all rooms, gift/souvenir shop, facilities for disabled guests, Wi-Fi in public areas, car park. Step into one of 16 inviting rooms and escape the stresses of the day with a wide range of amenities such as television LCD/plasma screen, internet access � wireless, internet access � wireless (complimentary), air conditioning, wake-up service which can be found in some rooms. The hotel offers fantastic facilities, including outdoor pool, massage, garden, to help you unwind after an action-packed day in the city. Whatever your purpose of visit, Bambu Hotel is an excellent choice for your stay in Battambang. Recent renovated, the Banan Hotel guarantees guests a pleasant stay whether in Battambang for business or pleasure. The excitement of the city center is only away. A well-kempt environment and its proximity to Centre Culturel Fran�ais, Consulate of Vietnam, Wat Peapahd give to this hotel a special charm. At Banan Hotel, every effort is made to make guests feel comfortable. To do so, the hotel provides the best in services and amenities. Top features of the hotel include 24-hour room service, free Wi-Fi in all rooms, facilities for disabled guests, Wi-Fi in public areas, valet parking. In addition, all guestrooms feature a variety of comforts. Many rooms even provide clothes rack, complimentary tea, mirror, towels, closet to please the most discerning guest. 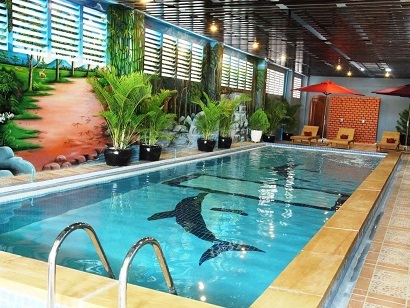 The complete list of recreational facilities is available at the hotel, including massage, garden. Whatever your purpose of visit, Banan Hotel is an excellent choice for your stay in Battambang.